Museums and cultural institutions realize the need for a robust digital and mobile marketing strategy to meet the informational demands of today’s visitors. Yet few institutions have all the funds they need to meet their future ambitions. This can change for VAM member institutions by leveraging VAMONDE in their marketing efforts. Visit VAM's VAMONDE channel to learn more. View the 2-minute introductory video! Our channel will only get better and better with more of our museums adding their digital stories, and sharing information about the app on their websites and promotional materials. Join us and see for yourself! Instead of building separate digital platforms for each organization, VAMONDE has built one network for all. This network provides the newest innovations and reduces costs by sharing the network together. 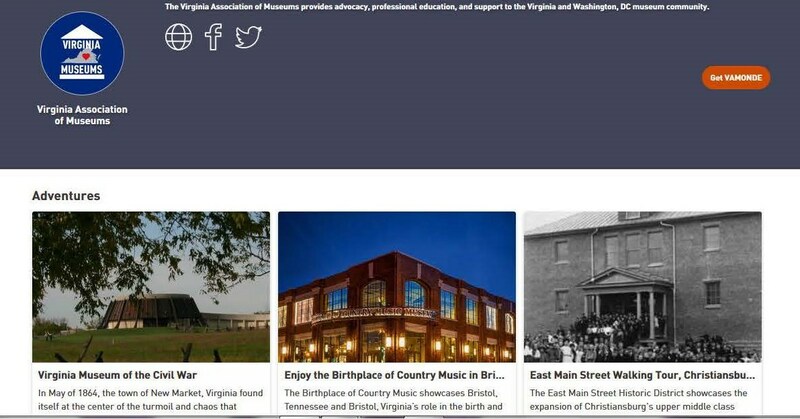 You can use VAMONDE to feature your organization's stories (exhibits, events, history, artifacts, galleries, educational content, videos, and more) along with other cultural institutions across Virginia and beyond. Finding your stories is easier when an interested audience is using the same network to search for or actively explore great content and DISCOVERS YOUR Institution! Start your multi-media story on VAMONDE and then draw users to your website. Guide users to your special call to action for tickets, events, tours and track your results through VAMONDE's analytics. Bring together your existing content (blogs, Facebook, YouTube, etc.) to create one enriching story. Amplify the experience by facilitating learning in the places history, art, culture…happened. Extend your brand and reach across your city with themed adventures/tours. Have an update or need to make an edit? Make changes in real time with ease. Create any Call To Action to capitalize on a deeply engaged audience. Drive ticket sales, membership, donations, contests, programming. Anything. Understand how people interact with your content. See which content converts into physical visits.